Enjoy a full-day tour from New York City to the capital of the United States, Washington DC, with a professional guide. Visit iconic landmarks like the Vietnam, Korean and Iwo Jima Memorials, and Arlington National Cemetery. Stop at the White House and the US Capitol and have free time to explore the Smithsonian's Air & Space Museum. Enjoy a fascinating day at the Capital of the United States. Learn the history of the colonies, the American Revolution and the Civil War. 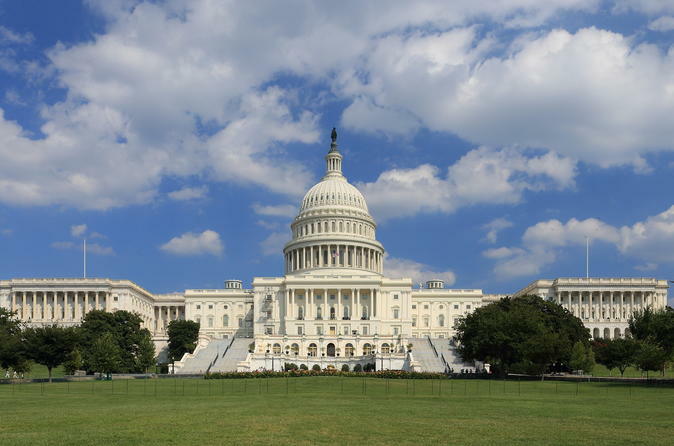 See Capitol Hill home of the US Congress and learn about the structure of the U.S. government. Stop at the White House, home to the President of the United States and the West Wing. Visit the Lincoln Memorial, the Iwo Jima Memorial and Vietnam & Korean War Memorials to understand how these events changed the country. Visit Arlington National Cemetery where over 200,000 soldiers have been buried since the Civil War. Stop at the Kennedy grave site where two brothers are buried. Spend time at the Smithsonian’s Air and Space Museum, a monument to the technology of the twentieth century, whose exhibits include the Kitty Hawk, Spirit of St. Louis, command modules from space flights like Apollo 11, and more. Enjoy the history, the politics, the beauty of the city and the amazing contrast to New York!